SALT LAKE CITY, UT, April 3, 2017 – For the first time in 20 years, veteran adventure travel company, Holiday River Expeditions (https://www.bikeraft.com/), is offering commercial rafting trips on the Dolores River in Colorado this spring. The route will include the lower section of the river that includes Stateline rapids (class IV) and various others ranging from class II to III. The distance from the put-in at Gateway to the confluence of the Colorado River is 33-mile course through ranchland and wilderness steeped in history. The journey continues on the Colorado past Fisher Towers and other iconic red-rock vistas to our takeout. 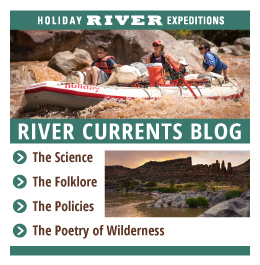 Trips begin and end at the Holiday River Expeditions headquarters in Green River, UT. Included in the rate are transportation to and from the river, river bags, life jackets, hearty meals / snacks, river guides and all equipment. Commercial rafting adventures on the Dolores has only occurred a handful of times since the dams construction. These ‘Goldilocks’ conditions rely on heavy snowpack in the mountains coupled with a cool and wet spring. All this leads to a bountiful spring runoff. So far, these conditions have been perfect. “With our recent announcement that we are able to once again offer scheduled trips on the Dolores River, we are looking at an epic rafting season for 2017. The fact that we haven’t run this stretch commercially for two decades has all of our guides and ardent past guests thrilled and energized!” said John Wood, Co-Owner and President of Holiday River Expeditions. There once was a time when the Dolores River was on every river rafter’s to-do list. However, the McPhee Dam, completed in 2000 to provide water flow for irrigation needs, has curtailed the river’s annual recreational appeal. While folks may still be able to get on the river at a moment’s notice and run it when there might be enough water, the opportunity to actually plan on running trips commercially has not come along in quite some time, Wood explains. The year 1997 was the last time his company created a pre-set adventure on the Dolores. Here is an article about the Dolores and how it has been a struggle to run it commercially since the early 2000’s https://www.outsideonline.com/1825026/dry-run-river-sorrows. 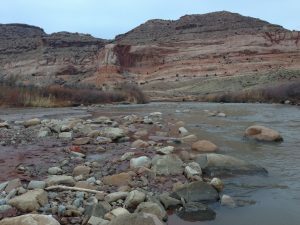 Thanks to the 2017 snow pack McPhee will begin release water in early April, with the targeted first rafting day between April 11 and April 16. In late May authorities expect the flow to spike. Plans call for releases at 2,000 cfs for several weeks with minor adjustments for increased inflow leading up to a 4,000 cfs spike for 5+/- days around the third week of May. The flow will drop back to 2,000 cfs for the Memorial Day weekend and to the end of the spill in early June. The 2,000 cfs is considered medium high for this river. A long and winding river, the Dolores flows through canyons packed with enormous ponderosa pine trees and high sandstone cliffs in brilliant oranges and red. It continues its journey from the alpine scenery into the high desert, through canyons dotted with amazing white water, ancient ruins and untamed wilderness. The river sits about 50 miles, as the crow flies, from Moab; home to Arches and Canyonlands National Parks. The run starts out from the Gateway launch site at mile 141 as a mellow float characteristic of the sections just upstream. Within a few miles, the action begins to pick up with some Class II and III rapids before reaching the highlight of this section at Stateline Rapid. Rafters can then mellow out with the river, enjoying a scenic float to the Colorado. Higher than normal spring runoff is also predicted for another company favorite: the Green River through Lodore Canyon in Dinosaur National Monument. The company also expects a high-adrenalin spring season here, fed by predictable releases from Flaming Gorge Dam that may ramp up to 6,600 cfs well into June.